A view of Beirut from the mountains. My mind is muddled, my heart is full (with both joy and sadness), and my tummy is wrecked. Absolutely wrecked. That is the abridged version of my month in Beirut. There never seems to be enough time here and I’ve learned as frustrating as this place is (and trust me on this, it takes all the patience one can muster just to survive and then some) every single moment here is precious. It’s always fascinating what being here does to me. When I’m not completely traumatized, I’m just so in love with it. It also has a way of bringing all my junk to the surface. I’m completely aware of just how helpless I am and how much of people’s pain and need I shut down to. This is my third try at a blog post on what I’ve seen in this crazy (is there a harsher word in English?) city and what I’ve been able to do. The first draft was on the political situation and how the influx of close to 2 million Syrian refugees is breaking this country of 4 million. The second was on storytelling; it was a nice, touchy-feely, fluff piece. But, at this point, I think it’s best as my mind, heart, and soul settle to all that has happened in the last month to share with you some of what has touched me deeply, the good, the bad, and the ugly. I’ve been volunteering with the JCC (Joint Christian Committee for Social Service in Lebanon). They are an established NGO serving Palestinian refugee camps for over 50 years across the region. (Check them out here, http://www.dspr-me.org/jcc.html). JCC is run by Sylvia Haddad, a Palestinian Christian, whom I have much respect for and have learned a great deal from. She herself is a vast resource on the Palestinian people and the history of Middle East. She carries an incredible legacy of her family’s ancestry from Jerusalem. I could listen to her stories for hours, and I have! JCC is actually known as the church in the Muslim and somewhat militant camps of Lebanon. They have a very good reputation with those they serve. My job while I was here was to go to the various camps to meet with people and collect stories of how the JCC has impacted their lives. It’s been a privilege to sit with so many and hear their stories. That’s the background to some of the little snippets that follow. I hope it gives you a little peek into the lives of Palestinians and Lebanese and Syrians and this very precious region. These gentlemen are Syrian and Palestinian refugees from Syria. 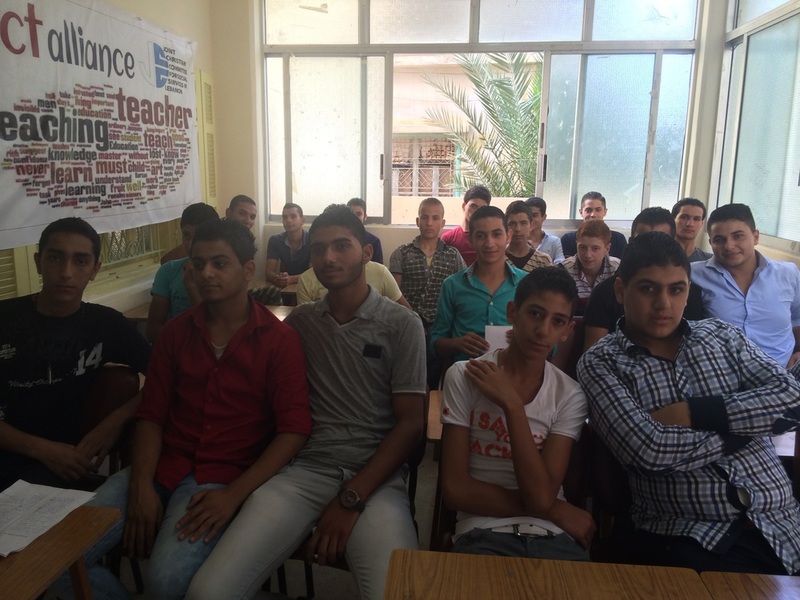 They came to a 12th grade registration at JCC’s Saida center this month. JCC is the only organization in Lebanon that is continuing the education for these refugees because they have been banned from attending Lebanese schools. They will study Syrian curriculum taught by Syrian teachers who are refugees themselves. They will then travel back to Syria, yes in the middle of the war, to take their final exams to pass secondary school. These young men were attentive, well behaved, and asked really good questions. You could have heard a pin drop during the registration. They knew it was their only chance at an education and most of them have lost 2 years of school due to the war. As I sat there and looked at their faces, each has a story that would break your heart, I wondered what I would do for an education. Would I risk going back in a war? How much is the value of education when one has been denied it? To me, these are the faces of hope. This woman is a Palestinian refugee from Syria. She was born around Haifa, Palestine and in 1948, at the age of three, fled with her family to Aleppo, Syria. She lived there for 66 years until last year where she fled to Lebanon and Dbayeh camp. Dbayeh is the only Palestinian Christian refugee camp in the Middle East. At the age of 69, this woman is a double refugee living in limbo in Lebanon. How do I as a Christian stand with her as a sister? Last Sunday, an Iraqi family came to the church I go to in Beirut. They had fled from Iraq 6 weeks ago. They came with a letter from Andrew White, the vicar of Bagdad, asking for help. I honestly wasn’t sure what the story was or entirely what was going on. We all went to lunch and he told stories of his life. His wife died a few years ago. He showed us videos of his wife on his tablet, along with his work. He makes crosses out of nails; he gave me one after church. I didn’t understand everything entirely. I think I chose not to. I was on overload. I’m immersed in the tremendous need here with the Palestinians and I’m completely overwhelmed by how bad their situation is. Every single day I get bombarded by not one or two or three, but multiple Syrian children, Syrian women holding their babies and the elderly. When they realize I’m a foreigner, they run after me. They tell me how hungry they are, they tell me how sick they are, and beg me for money. Some grab on to me and some of the children have grabbed things out of my hands, it’s overwhelming. I cannot give to everyone and I hit the limit of what I can do in the face of unending need. This happens nearly every day. So you see, I didn’t even realize how serious the Iraqi family’s situation was until later that evening when I came out of my fog. To my shame, I had shut down. It was more than I could see or hear or feel. I can’t help but feel like I failed on some level. Failed to help fellow Christians or even to stay present to their stories and pain. Did I fail or am I experiencing compassion fatigue? And if I’m experiencing that after only one month, what would it be like if I was a Lebanese and have this be the daily reality of my country? I’m struggling to continue to move forward and do what I can, when it never seems to be enough. Last time I was in Chatila camp was 2 years ago. It’s an overcrowded, very poor, small Palestinian Refugee camp right in the middle of Beirut. I was asked by the JCC to help take a group of Americans through it and help explain the Palestinian condition in Lebanon. The group was unresponsive and complained about walking through the camp. At first I was angry with them but I was reminded of how I shut down earlier in the week. Maybe their complaining and indifference was their defense mechanism to deal with what they were experiencing. For me, I still have many emotions surrounding the interaction I had with them and the camp. Chatila has always been a horrible place, how could a place like that get even worse? I didn’t think that was possible. The influx of Syrian refugees into the camp has made living conditions and overcrowding even worse. I have spent the last 10 years of my life working to improve or at least meet the needs of Palestinians in refugee camps in Lebanon. Their living conditions are getting worse as is their overall situation. I left the camp in tears and with a heavy heart. My last weekend here, a dear Lebanese friend took me sightseeing in Batroun, a Christian village north of Beirut known for its beautiful beaches and wineries. Yes, my priority was to find a winery and my Muslim friend always obliges me with amusement over my love affair with Lebanese wine. Have I ever mentioned just how fabulous Lebanese wine is??? We found a winery after getting lost several times. They were closed and only took appointments for wine tasting. But, being Lebanese they invited us in and gave me a wine tasting anyway. They are a family run vineyard and winery. They were incredibly sweet and welcoming not to mention their wine was incredible and organic! (Check them out here www.batrounmountains.com). We had an hour and a half conversation about Lebanon and all the problems here. Oh and we talked about Daesh (you would know them as ISIS) which is a very big topic since the threat is real in Lebanon. And very, very close. My friend, who is a Muslim (she also happens to be one of the most tender-hearted human beings I have ever known) told the other woman that she hopes the Christians stay in Lebanon and they wouldn’t leave because of Daesh. She said it wouldn’t be Lebanon without the Christians. I’m not sure if the other woman knew she was a Muslim or not, but I was blessed to hear what she said. With a very simple statement she lived out reconciliation in a single moment to a fellow Lebanese. And I got wine. That does seem like an appropriate place to end my stories of Beirut, for the time being.